How about: if we reach 50 comments (by separate participants), I'll draw not one, but two names. Two lucky winners, who will each receive the pattern of their choice. Of course, all the rules laid out originally still apply. 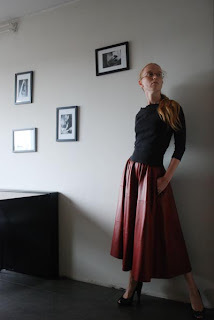 This skirt was the first item for which I drafted the pattern myself. 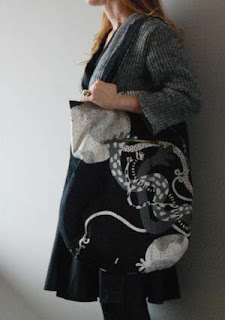 I made it when I was taking a course in pattern making with M 2,5 years ago. It has a high waist and curved pieces set into the sides. The fabric was a wool remnant I bought at the fabric store. I wanted some good material for my first real own garment and it is. However, that also meant I had to make do with a small piece and was limited to making a fairly narrow skirt. It really is a winter skirt and I still love it. The cardigan is one of a pair I whipped up last year from what was then a mystery fabric, which I had been able to buy very cheaply. On closer inspection, it turned out to be cooked wool knit. It's warm, a bit bulky and it doesn't fray or curl up. 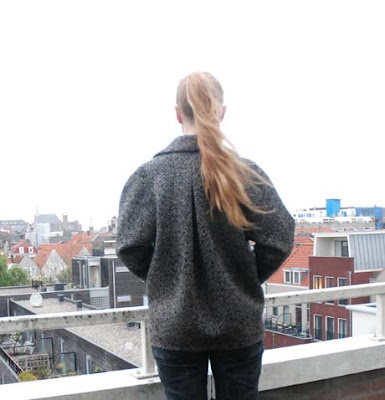 For those reasons, this cardigan is one of very few of my creations to have unfinished edges. When I posted last week's 'weekly outfit', I fully expected the snow to be gone pretty quickly. 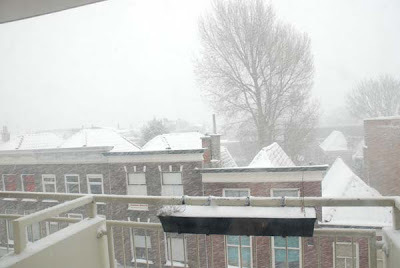 That was why I took the effort to take the picture on my balcony. Usually, any snow we get here melts within two days. Little did I expect what happened next. On Saturday, the snow didn't melt and on Sunday, it was snowing again. We had snow all day on Sunday. It ended up being a layer of between 10 and 20 cm. 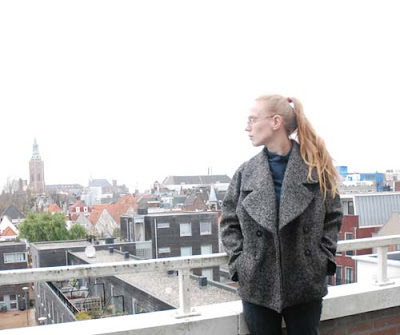 In The Hague, the Netherlands! I haven't seen this much snow in my hometown for at least 5, but more likely 10 years. I know it's pretty pathetic compared to a lot of other places, but it's pretty impressive here. There were no trains on Sunday. A collegue of mine was stuck in another city and didn't get home until Monday afternoon.This is what it looked like from my kitchen window on Sunday morning (the layer of snow got thicker later on). The snow is slowly starting to melt now, but might freeze up again tonight. Luckily, I can walk to work. Normally I ride my bicycle, but I'm not biking on slippery surfaces. Now, I walk through an eerily quiet city (the trams are still not back to their usual timetable). The pavements are covered in caked snow, the roads are muddy slush. You can't actually see where the one stops and the other starts, so I take big steps over the snow/slush mounts at the edges of the roads. As M says, it has been great weather to stay indoors. Which is just what E and I did on Sunday. That gave me the time to do some sewing and look through my stash materials. I didn't really get to my fabrics because I spend a lot of time looking through this, and another (less picturesque) box like it. My grandmother gave me her old boxes of buttons last year. There is no really fancy stuff in any of them, but I just love the stories these little collections tell. 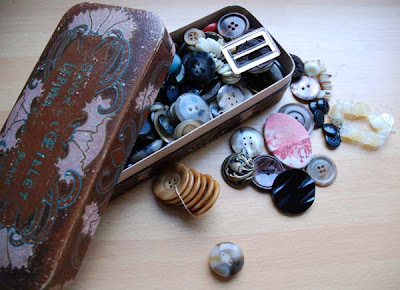 Similar buttons are oftern threaded on pieces of string, to keep them together. With the small ones, they often don't all match. It seems that some ladies in my family would cut the buttons of all worn-out, un-salvagable pieces of clothing and kept them in these boxes. As organized as possible. I used some of those not-quite-matching little mother-of-pearl button for my white shirt, and as always, told myself to come up with a design which would make use of some of the more eye-catching buttons. 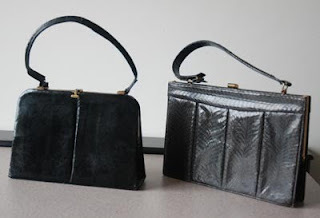 There are two other, very small boxes holding old cufflinks, plastic broches and a belt clip. I'll show you those later, hopefully when I use some of their contents. I just love sewing supplies with a history. Do you have any of those stories as well? I would like to ask you to give your honest opinion about this. I've been looking at belt pleated trousers in high fashion magazines for a while now, and the idea slowly warmed to me. So I decided to try and make a pair for myself. 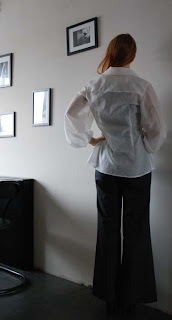 As usual, I drafted my own pattern (some of the belt pleated trousers I liked in magazines had lower waistbands, but I kind of liked the high waist in the muslin). I'm reasonably satisfied with it, if I wanted to make this again my only change would be to make the pocket entry a little deeper than it is now. For fabric, I used the same thin wool as for the flared trousers. What I'm not so sure about, is the look. It doesn't help that it seems like it just doesn't go with just about anything in my wardrobe (proportion-wise, that is) but that isn't even the whole point. I've been trying it on while I was working on it and afterwards and my own reaction varied from: "Wow, this is cool" to "this is just weird". I hope you can see my point. I'm looking forward to reading your thoughts on this and I should really give these the wear-out-of-the-house test this week. Ok, I know I'm cheating a bit here. I should have posted this last week, but I was busy with other things and the weather was so hidiously gray and dark that there just wasn't enough light in the house to take any photographs. In this picture, I'm wearing the new dark grey trousers I wrote about before, a cooked wool cardigan I made about a year ago (I posted about it on Burdastyle back then) and a very simple black top from H&M which I have owned for at least 2,5 years (this is one of a very few RTW staple items which I still wear a lot). 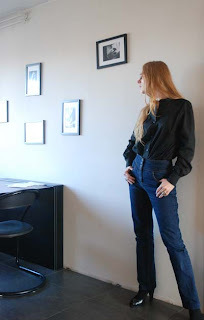 I got some nice comments on my latest pair of trousers (both here, and on Wardrobe Refashion) and with them, some questions about the pattern. The pattern is, like that of most of my creations, drafted by me. Therefore I can't give you an easy route to making them. However, I can share a few simple tips. If you're going to alter a pattern, any pattern, use one you've used before, or make a muslin first. Use that to sort out the fit. 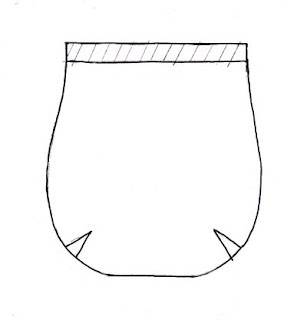 For this project, you need a fairly basic trouser pattern. Leg shape doesn't really matter but the pattern should be fitted at hips and waist and, if you want a style like mine, have a fly front, a waistband in curved pieces and scoop pockets. To make things easy for yourself, trace the main pattern pieces (front and back legs) on a new piece of paper. Then, you alter the leg shape like the (very clumsy) drawing shows. Starting to widen the leg at different points will result in very different looks. 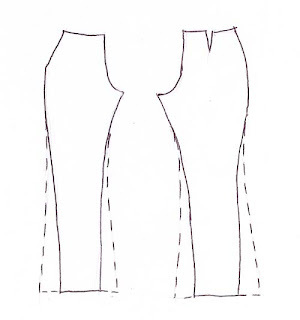 Start at the knee and you will get a boot-cut to 70's flare, depending on the width at the bottom (see the jeans in weekly outfit nr.9). 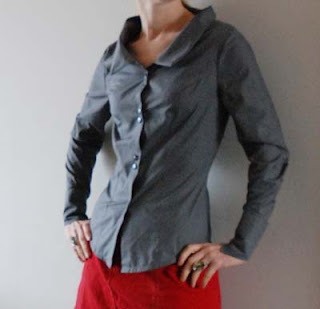 Start at the hipline/crotch and your trousers start looking a bit like culottes. For my trousers, I started widening the legs at about mid-thigh, flaring out more from the knee down. At the bottom, they are between 55 and 60 cm wide. Of course, I don't have to tell you that to get a great end result, the bottom width should be considered in relation to the rest of the measurements. I only made the skirt I wear today. At least a year ago, maybe longer. The fabric for it was a remnant from a usually fairly expensive seller and, true to form, I wanted to use all of it. And I really liked the look it had when I just draped the fabric around my hips trying to come up with a design. 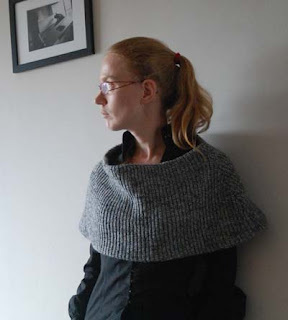 When I published it on Burdastyle, several people wanted to know how to make it, but I never got around to making a how-to. 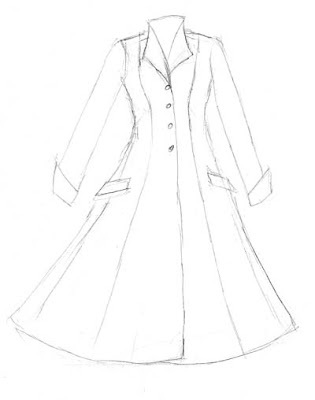 The sketch shows an normal highth skirt pattern, mine is high waisted, obviously there is plenty of room for variation there. I also made separate waist pieces (with a gentle curve, no point) at the front, just because I like to make sure the front and back have some kind of relation to each other, appart from being attached at sides. 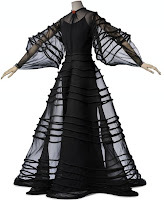 Keep in mind that the wrong side of the fabric will show at the back drape. When sewing the skirt, you have to stitch the center back seam of lower piece first, with the wrong sides of the fabric facing. 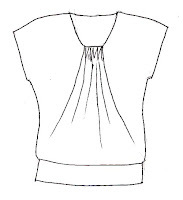 If the length of the skirt requires a walking slit, leave a piece at the bottom open. Then, you finish the edges of the drape piece (I narrowly hemmed by hand) and sew the upper back piece together. The tricky part come next: attaching to whole thing neatly. No real trick to help you there, this just takes some careful sewing. Once that's done, you can treat it like any other back-of-skirt. 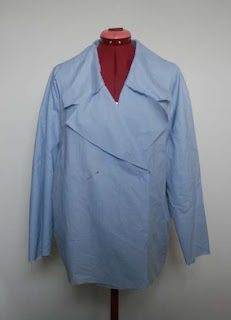 Today, I have been able to do a lot of work on my new coat. I loved it, and I'm really looking forward to seeing it finished and wearing it. I just hope I can find the right buttons on the market tomorrow. 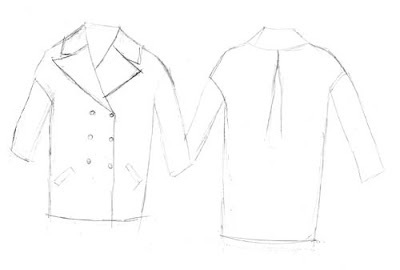 Working on it got me thinking: is there anything I do in coat construction which could be considered a 'sewing secret', something I could share here? Earlier, someone asked me for tips on sewing heavy wool fabrics. Honestly, I don't think I have any. In my experience, midweight and heavier woolen make the most lovely fabrics for sewing. The stretch of the fibre itself makes it very forgiving and it allows itself to be molded into shape by sewing and pressing. Handling the sheer bulk of a thick wool coat under the sewing machine arm can be tricky, but, once again, the fabric is very forgiving. Even if your stitches get uneven because the fabric got snagged somewhere, it won't show through the texture of the fabric. That is a bit of a sewing trick by the way, one I assume most of you are very well aware of already: always press your seams. It may sound fussy, but believe me it's worth it. Having all your seams pressed can turn your creation from housework to personal couture. And it will make things like creating welt pockets and inserting gussets a lot easier. The real 'sewing secret' I wanted to share in post, however, is another one: know your fusibles. 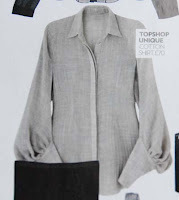 Choosing the right kind of interfacing for the job at hand can be almost as important as choosing the right fabric. 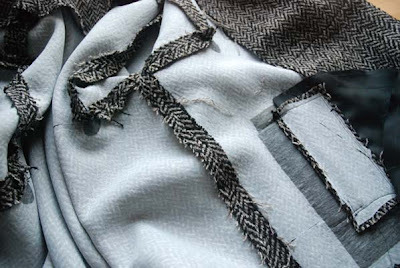 And you can forget about vlieseline straight away, there's a whole world of woven and knit fusible interfacings out there which work a lot better for most jobs. 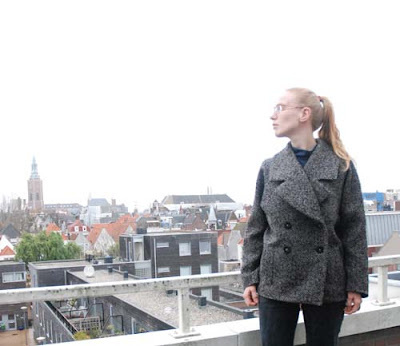 Vlieseline is made from fibres which have been pressed together. This means that in one direction, you can easily pull it apart and it can get quite stiff and 'paper-y' when ironed on. I only use it to back the fabric where I want to make something like a welt pocket. Because it is made of pressed fibres, it can't fray. Usually, I use a light woven fusible for shirt collars and button bands and a heavier kind for skirt and trouser waistbands or facings. Elaborate wool garments like coats and jackets get a special treatment. M taught me this when I made my first coat and jacket, under her guidance. You can buy a special kind of fusible interfacing for wool fabrics. It resembles thin, soft, loosely woven webbing and should be applied all over the inside of the garment (excluding seam allowance). When pressing it on (you can use steam with this stuff), you have to use a pressing cloth, otherwise it will stick to your iron. 'Interfacing' (yes, I know it's technically cheating to use that term here) like this will prevent unraveling and add weight and 'body' to the fabric, allowing you to create a garment like soft sculpture. A few weeks ago, my self-made grocery-bag was stolen. After handling with the obligatory bussiness of blocking and replacing credit cards, mobile phone and things like that, I realised that this left me without my favorite large take-it-anywhere-bag. I just had to make a new one. ywhere there because I considered it too stiff and rough for clothing. I just freehanded at making this bag, but this is how you could do the same. You can make it any size but mine is about 60 by 65 cm. The band (about 4 cm wide) at the top should be interfaced and will later be turned in, this will be the facing. If you line the bag, cut the lining from the pattern minus this top bit. First, you sew the darts, than the outline of the bag. Do the same for the lining. If you what to make pockets (inside or outside), put them on the panel where you want them before sewing the outline. Decide on the length and placement of your shoulder straps, sew them and attach them to the top of the band (if you make fabric straps, interface them for strength). Right sides together, sew the bag and the bag lining together along the top edge, catching the shoulder straps in the seam. 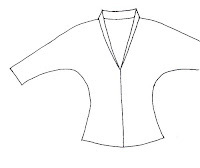 Turn it right side out through a gap in the lining outline seam (and close that by hand). Make sure to turn in the facing, and topstitch it in place. Also topstich the shoulder straps to the facing. I hope these instructions were helpfull, let me know if there's something I need to explain better. 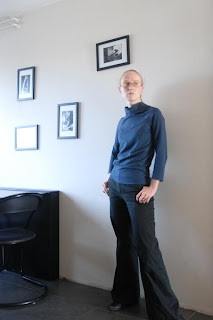 If you follow Wardrobe Refashion, you may have seen a part of this outfit already. I posted the cardigan there the day before yesterday, just after completing it. 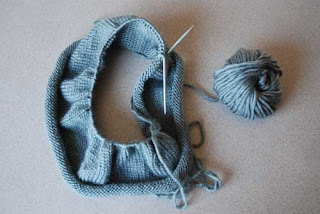 If you don't follow WR, here's the story: my boyfriend had two large sweaters in a tweedy wool-poly rib knit. They were outdated in shape and had been taking up space in our wardrobe without being worn for as long as we've living together (more than 4 years now). So I convinced him to let me have them. This cardy was one of the results.